Last week, a very interesting book named Exotic aliens was released in Delhi. Written by a trio of authors — the legendary wildlife writer Valmik Thapar, acknowledged historian Romila Thapar and Moghul history scholar Yusuf Ansari — it is a debate about whether lions and cheetahs existed in India or were they introduced by man. While many agree that the cheetah seems to be exotic species, the authors have spawned a new debate that the lion too, is. They have created serious doubts through a historical enquiry that questions the indigenous nature of these animals, suggesting that lions and cheetahs were possibly introduced by the hunters or rulers of old times who brought them from faraway lands due to their fascination with exotic species. The presence of lions in our ancient sculptures and paintings are not enough as proof of their natural presence in our country. There is an argument that these may be influenced by the globally powerful image of the animal and may not have been inspired by the actual, physical presence of them. The book is well researched and has systematically examined all the possible proofs in support of the lion’s presence. 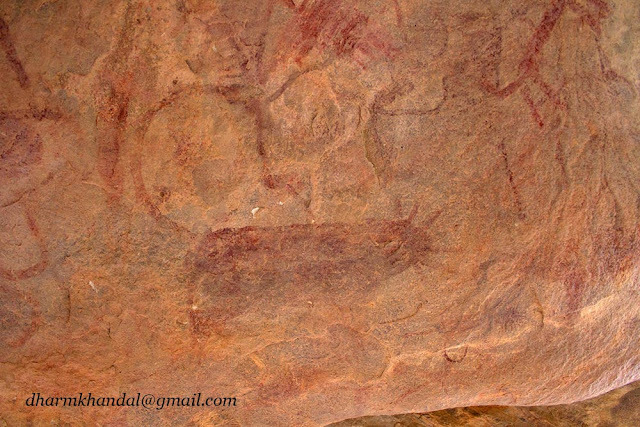 They start with documentations going back to the prehistoric times of 8,000-10,000 years ago, when primitive man made rock art in caves. 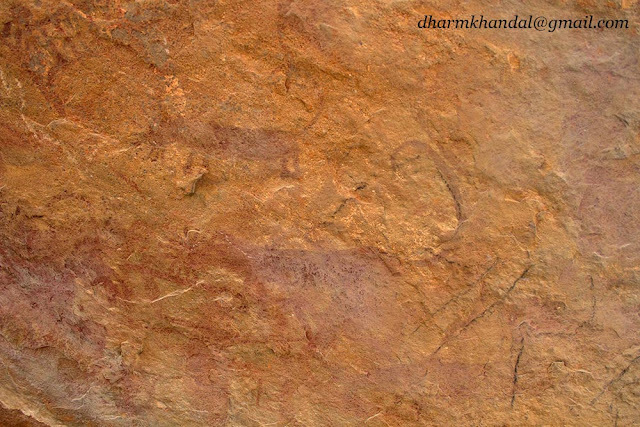 The authors quote Erwin Neumayer’s book, Lines on Stones, on prehistoric rock art of India, revealing the absence of ‘manned’ felines on the rocks. 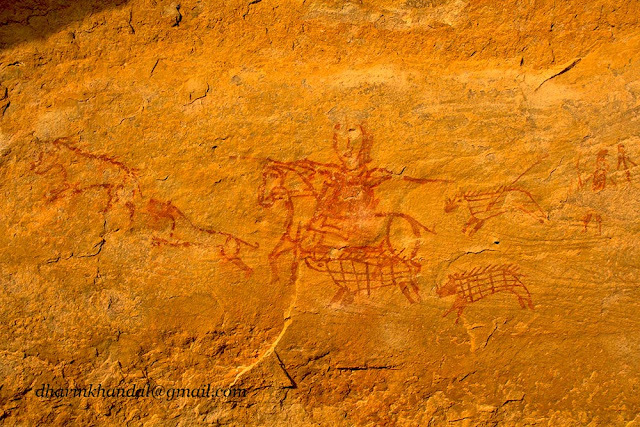 The book is 20 years old and in this period, many more cave or rock paintings have been discovered which we need to study in detail. 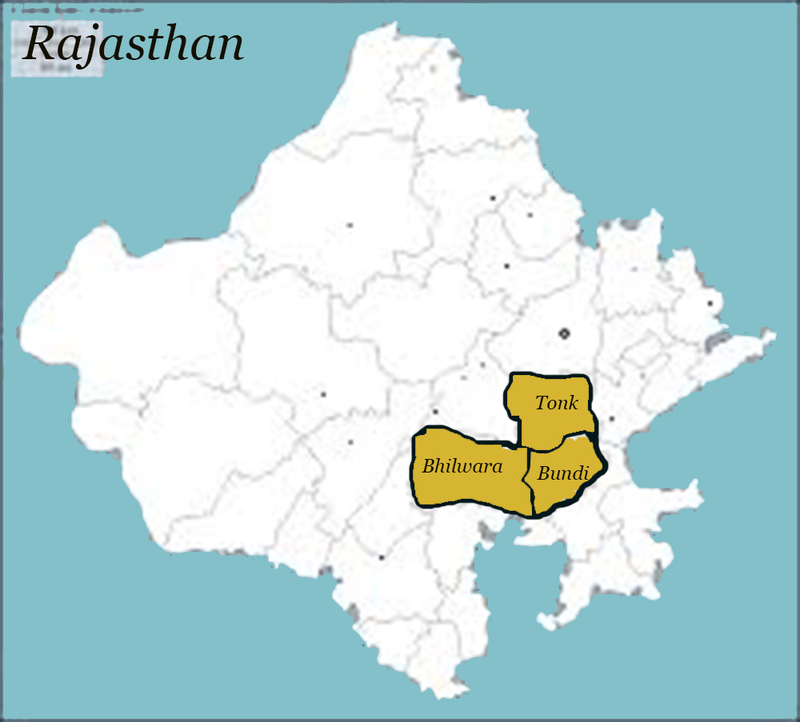 In last 18 years some very important rock sites are explored in Rajasthan state. I decide to investigate them and very interesting facts have come into light. These rock art sites are almost central point of the assumed lion distribution in India. Since 1995, a rock art explorer Mr.Om Prakash Sharma (kuki) discovered 90 rock art sites in the three districts of Rajasthan- Bundi, Bhilwara and Tonk. 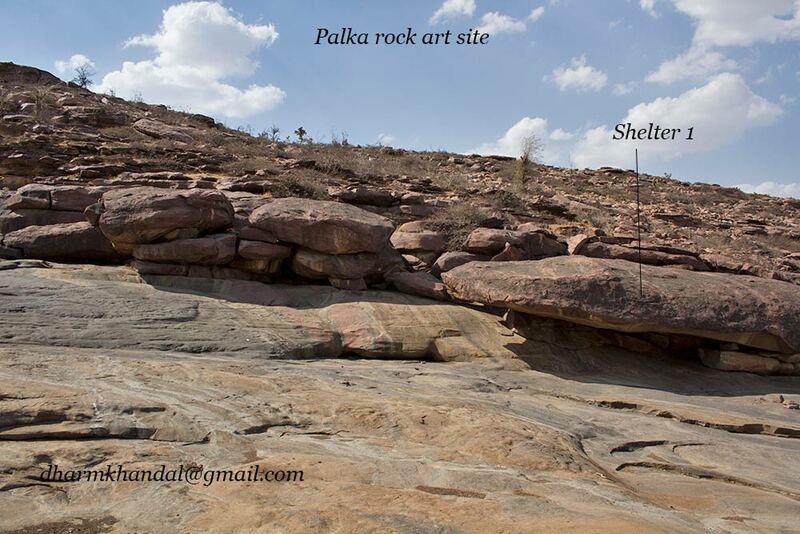 Each site has average 5-7 rock shelters /caves with rock arts. Some of the sites have up to 30 rock shelters while some of them have only 1 or 2. According to him at least 550 to 600 shelters are existing there. 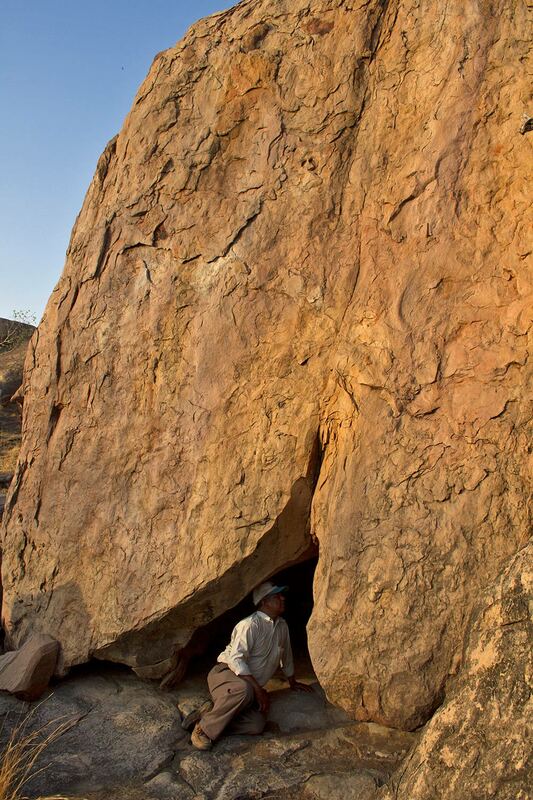 These caves are existing in the Vindhyan hill system, which hold large table tops. Open scrub forest and dry climate is also suitable for lions. This is a central area where on one side there is Gujarat, other side there is Punjab, Haryana and Pakistan. These areas were always thought to be the prime area for lion distribution, then the rock art sites should have some really clinching evidence of the lion depicted in the region. 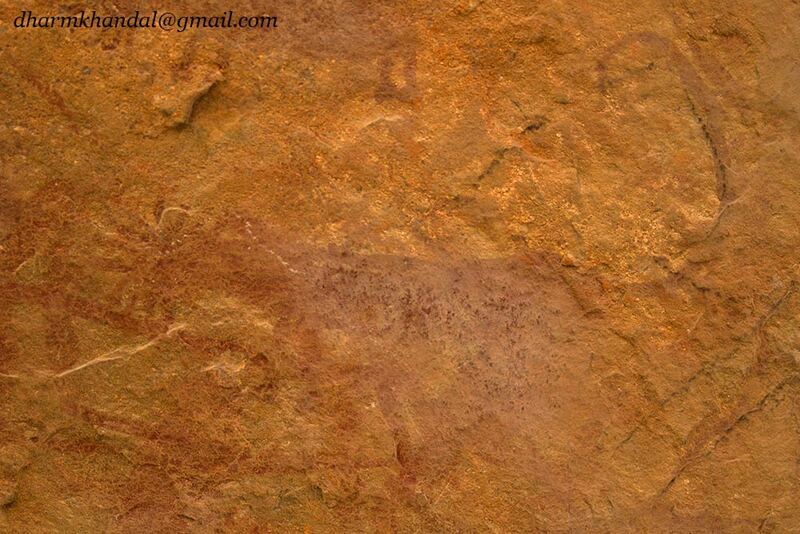 Out of the 90 discovered rock art sites, the explorer mentioned that only two sites have the lion like animal depicted. 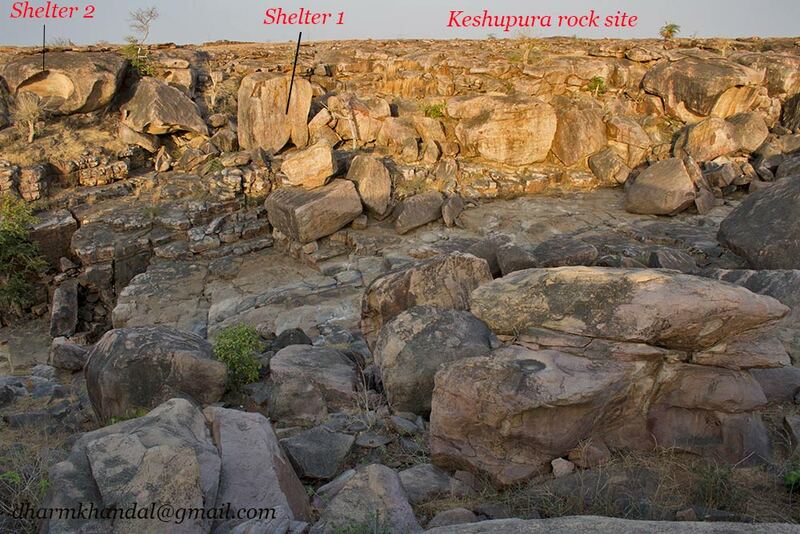 These 2 rock sites have 13 different rock shelters. The lion like images are found only in 3 shelters out of these 13 shelters, which means out of 550-600 shelters only 3 shelters have lion like illustrations. When I also inquired about the tiger’s rock art in these 550-600 rock shelters, according to the explorer almost 100 rock shelters have tiger’s graphics. 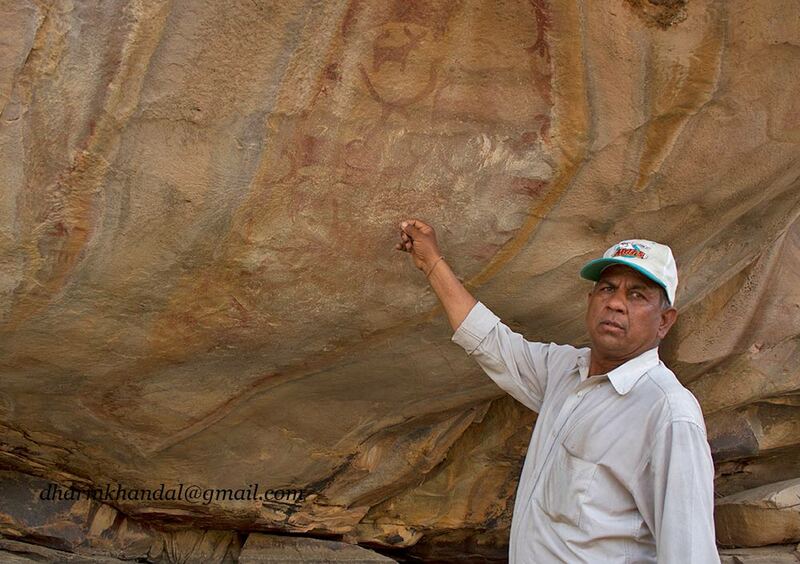 Mr. O P Sharma (Kuki) the rock art explorer of this region. Below are the two sites where the explorer mentioned that lion like animal graphics exist. Keshuprura is very scenic rock art site and have good rock paintings. 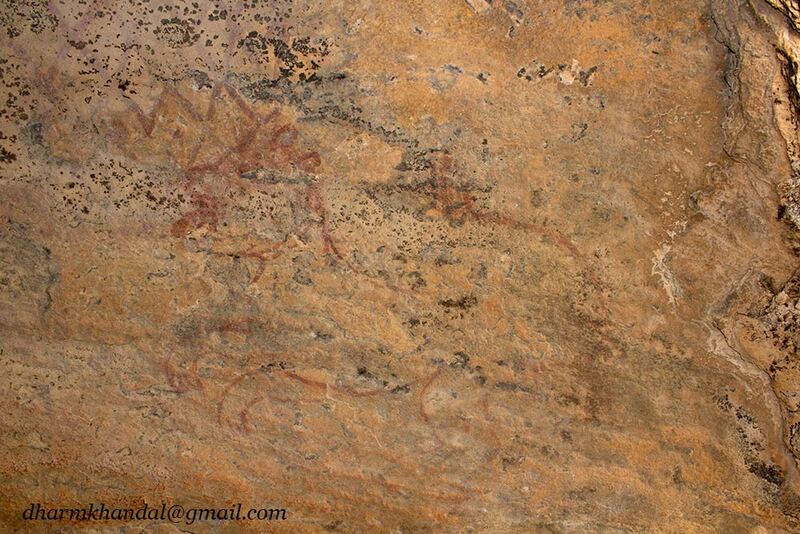 I found 2 lion like paintings here in two different rock shelters. 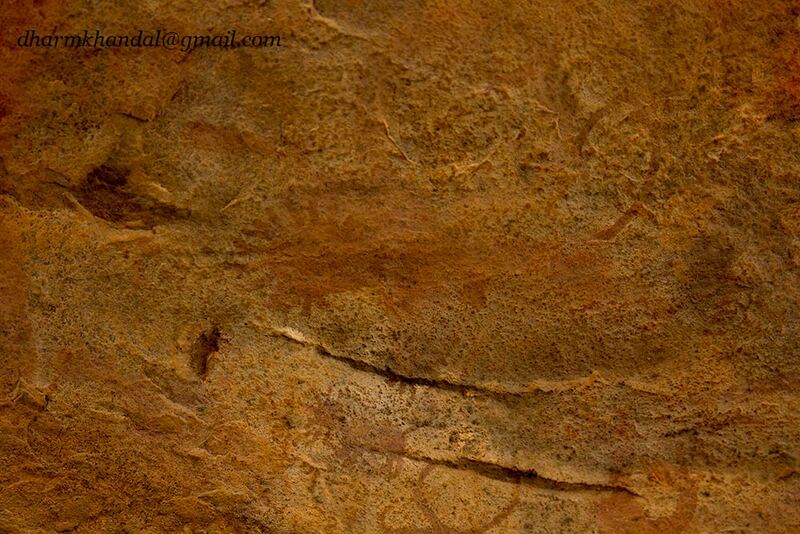 Shelter 1: The shelter is a small den which has 4 kinds of depictions. One is like a tiger, second is a net, third is lion like animal and fourth is an inscription. I have doubt that these paintings are from the prehistoric period, as there were inscription also which is unlike of that era. The lion like animal is not having mane and more like a dog. The explorer is unsure about the time period of the art. The art is more like a dog than feline and also having a neck band, and without mane. Shelter 2: this shelter is actually a very open panel, where old paintings can’t be safe for longer period because of it is exposed to the rain and other erosion factors. The panel was also having a painting of a horse rider who is killing wild pigs with help of a dog and using bow and arrow. I felt that the panel is a historic period paining which is hardly 200-300 years old. 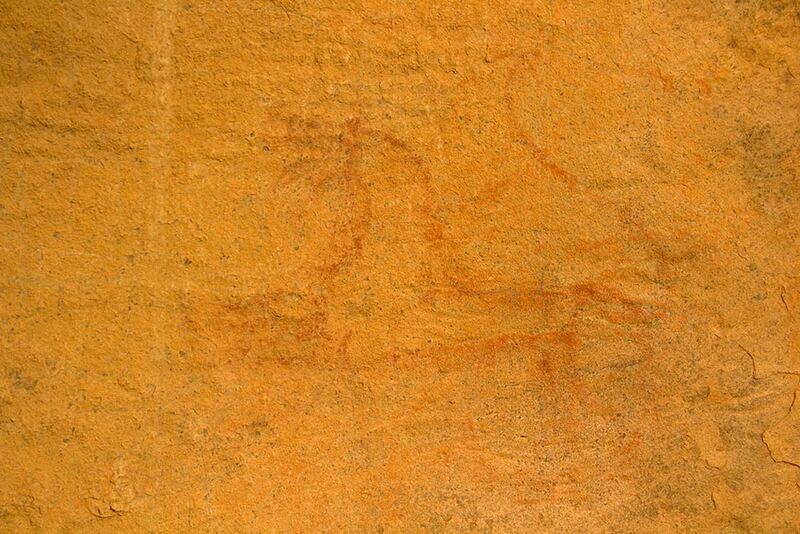 Horse rider and dog killing an adult wild pig (no pattern on the skin). Three piglet (with pattern on the skin) following the mother. In the same panel we found a lion like animal art. Lion or dog again a big question for me, panting tongue making it a dog but has a lion like tail. Age of paining is also uncertain. More of historic period according to the explorer. This site has 5 rock shelters. Out of 5 rock shelter only one is having feline like animal depicted in it. It is uncertain whether it is a tiger or a lion. This is the only predator like animal depiction. This shelter is having 8-9 different such animals. These animals are having mane like hair on the head but nothing on their shoulders. Lion is living in a pride but these lion like animal are solo paintings. A big question lion or tiger? Yes more like a lion. Hunting together with other similar looking partner. A maned animal but no mane on the neck part or shoulder. Another maned animal with two cubs, the cubs are also having mane, which is unusual. Is it a tiger only or a lion family? 1. Why the site is not having any tiger or the depicted animal is a tiger? 2. Why the cubs also have mane while no mane in the cub stage? 3. Why there is no female lion depiction? 4. Why there are not in a pride? Only two animals walking together. 5. Why this is the only site among 550-600 shelters to have such maned feline depictions? 6. 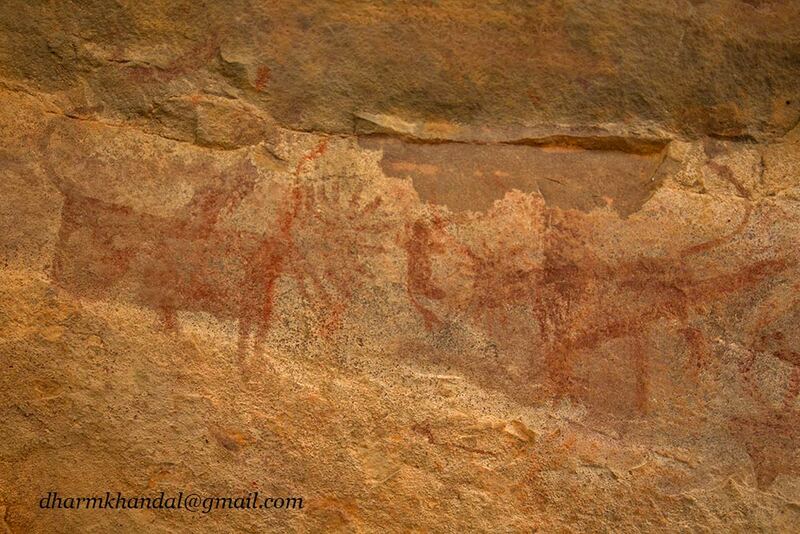 What is the age of the rock art? Pre historic or not?